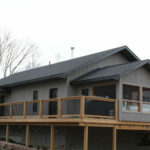 Monaghan Lumber Specialties has your decking needs covered. Whether your next project is big or small we have the right products to turn your ideas into reality. 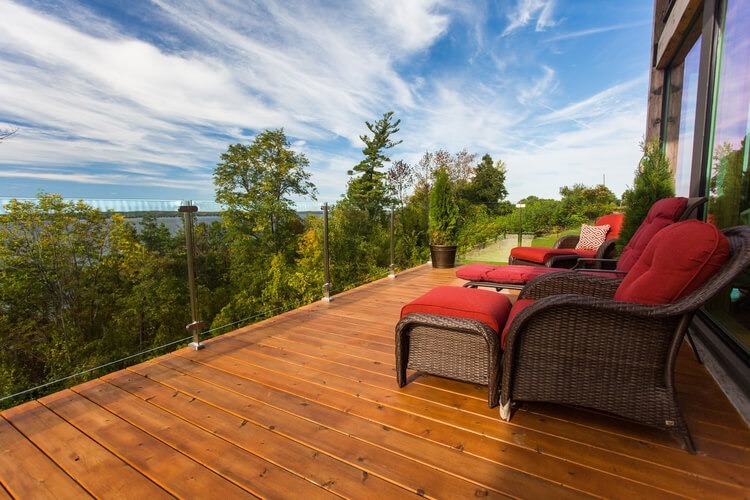 At Monaghan Lumber we host the largest in-stock selection of Western Red Cedar, Pressure Treated and Composite Decking in the Kawarthas, including lengths up to 20′ long! We also stock industry leading brands such as Trex, Endeck, MicroPro, Century Aluminum Handrail, Simpson Strong-tie and FastenMaster as well as exterior stains from Sansin, Cutek, Timber Pro, Sikkens and Woodplus. If we don’t stock what you are looking for ask us if it’s available on a special order, we regularly receive shipments from our suppliers allowing for prompt delivery of non-stocking items. When choosing materials for your porch, deck or dock there are a few key options to consider. Wood decks offer an unmatched combination of beauty and texture; however, many homeowners are drawn to composite decking products that are engineered for everlasting enjoyment with little to no maintenance required. While cedar and pressure treated decking is less expensive to purchase initially, over time, the UV rays from the sun will fade the decking to a grey colour without the application of a protective coating. Ideally, a penetrating stain with added pigment is utilized to maintain the desired appearance. Colour is a very important element to consider when designing your exterior living space. While wood can be stained almost any colour, composites are offered in a carefully selected colour pallet with limited options. It can be helpful to bring a sample or pictures of other exterior materials when shopping for decking in order to make the best choice for your project. To further help with the selection process we keep dozens of samples on hand and encourage customers to take them home and see them in their own space. Hidden fasteners are being used more every season to create a clean appearance free of screw holes and reduce installation time. Some composites such as Trex have patented their own fastening systems while other products such as Endeck or Lumberock use third-party systems like The Marksman Camo tool. 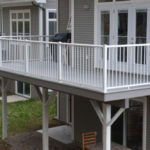 One of the most important elements of any deck is the railing. Handrails are often required on decks that are raised off the ground as well as on stairs. Handrails can be constructed from wood, aluminium, PVC, glass or steel. Each has its own benefits and drawbacks to carefully consider before making a selection; maintenance, appearance and cost are the most important elements to consider during the planning process. Last but not least are the accessories! A few carefully placed accent lights can take your deck to the next level and are easier to install than you may think. Added drainage systems are perfect for walkout homes, allowing the space underneath the deck to be used as a dry patio area, screened in porch or storage area. Exterior audio options are in the works and should be ready for next summer! Our decking experts are ready to answer any questions you may have, please contact us or drop by our showroom to start your deck off right. Please do not hesitate to contact us for more decking information.